In my previous post I discussed how to setup Pik on Windows to support managing different ruby versions on a single machine. For those who are interested, the following link is a great guide on how to setup RVM on OSX. However, when attempting to start the server again, I received the following message dialog. The program can’t start because sqlite3.dll is missing from your computer. Try reinstalling the program to fix this problem. To solve the problem (and considering this is only my local dev machine) I downloaded sqlite3.dll from http://www.sqlite.org/sqlitedll-3_7_2.zip. I then copied the two files into C:WindowsSystem32. As you may have heard, Rails 3.0 final and Ruby 1.9.2 have been released. These have got a large number of features, with both representing the next stage of Ruby development. While Rails 3.0 won’t cause too many problems, it does require Ruby 1.8.7 or higher. As Ruby has grown, multiple versions have been released which can live happily side-by-side. Sadly, command lines don’t make it easy to specify which version you want to execute. The same is true with Ruby. Yet, this is complicated by the fact that there are multiple different executables (gem, rake, cucumber, spec, rails etc) together with different gems depending on the core Ruby version – 1.8 and 1.9 will have different gems installed even on the same machine. Sadly, RVM doesn’t work on Windows. Thankfully, Pik does – “Pik is a tool to manage multiple versions of ruby on Windows”. Below is how I installed Pik, along with Ruby 1.9.2 and Rails 3.0 to start the next part of my Ruby development journey. My machine already has Ruby 1.8.6 (ruby 1.8.6 (2008-08-11 patchlevel 287) [i386-mswin32]) installed which means I can install pik via RubyGems. If you don’t already have Ruby, the README file on GitHub has a section called “Install pik using the installer“ which I recommend you follow. After downloading the gem, you need to install pik into a directory on your machine. This can be anywhere, apart from where you already have Ruby installed (C:rubybin). You need to include the directory used above in your %PATH% environment variable before the location of any existing Ruby installation. I put it at the start. When installing, simply specify the directory you picked. Thank you for using pik. After which, you will have three files in the folder. This is everything required for pik. I can now start working with Pik. Executing the pik command will locate all existing Ruby installations and configure itself. Executing pik list outputs all the ruby installations it knows about. As Rails 3.0 requires 1.8.7 or higher, let’s install the latest version of Ruby. Sadly, this still tried to install a dev preview, even with the latest version released. Luckily, it can be installed manually. After clicking next a few times, I installed Ruby into C:Ruby192. I then need to tell pik about my installation by pointing it at the bin directory. That’s it. You can then switch to the particular version you want, for example originally I was running 1.8.6. But I can then switch to 1.9.2 with a simple command. That’s the hard bit done. I didn’t have install pik but during the transition between 1.8.6 and 1.9.2 I *think* this will be invaluable. With 1.9.2 now configured and set as my current pik environment I can just install rails. 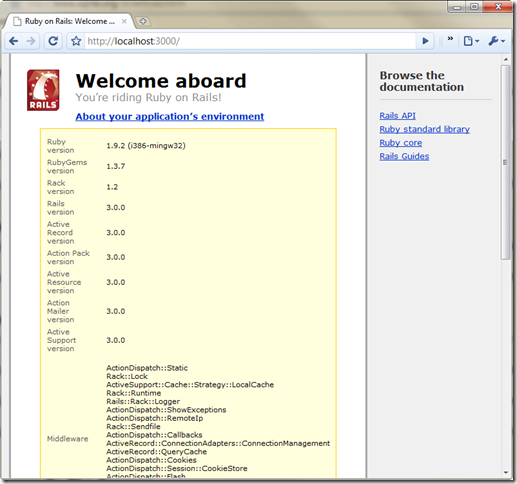 I now have our Rails 3.0 application running on top of Ruby 1.9.2 on Windows. * executing "sudo -p 'sudo password: ' mkdir "
After this, when you deploy it will not attempt to issue the commands as sudo, instead just as the user you are logged in as. It’s funny how you forget the simple things when you haven’t done them in a while. Tonight I wanted to setup MySQL on my Windows 7 machine. The installation was simple and I happily had my root account created. However, I didn’t want to use my root account for development – mainly because I didn’t want the password to be sorted in clear text. In order to create a new user, I used the command line MySQL client tool which allows me to execute commands against the server. You enter this via the command. This will then prompt you for the root password. I could have entered this on the command line as well, but again it would be in the clear. From the tool, I enter the following two commands. The first creates the user, the second assigns permissions.